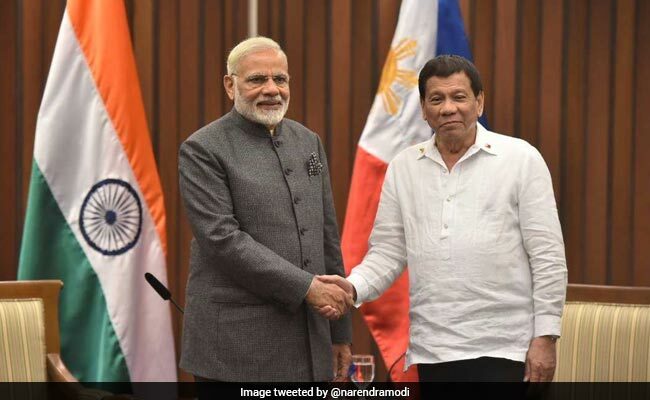 Manila: Prime Minister Narendra Modi today held a bilateral meeting with Philippines President Rodrigo Duterte following which four agreements were signed between the two countries. "President Duterte and PM Modi had an excellent meeting," Preeti Saran, Secretary (East) in the External Affairs Ministry, told reporters. "The President said he would like to have very good relations with India." Ms Saran said four agreements, including on defence cooperation and logistics, agriculture, and on micro, small and medium enterprises, were signed between the two sides. PM Modi arrived in Manila on Sunday on a three-day visit to the Philippines during the course of which he will attend the 15th India-Association of Southeast Asian Nations (ASEAN) Summit and the 12th East Asia Summit tomorrow. This is the first prime ministerial visit from India to this Southeast Asian nation in 36 years after the visit of then Prime Minister Indira Gandhi in 1981. Earlier today, PM Modi attended the opening ceremony of the 31st ASEAN Summit. On the margins of the summit, he also held a meeting with US President Donald Trump.